It’s no secret malls are in trouble. Stores seem to be closing left and right, leaving some malls nearly empty. A recent report from Credit Suisse forecasted 20 to 25 percent of U.S. malls would close in the next five years. Part of the reason for the mall’s decline is the rise of online shopping. Shoppers are increasingly turning to the internet, and malls have not kept up with the rapid pace of technological development. That’s starting to change, though. More mall owners and retail companies are realizing technology could save the American mall from its potential demise. 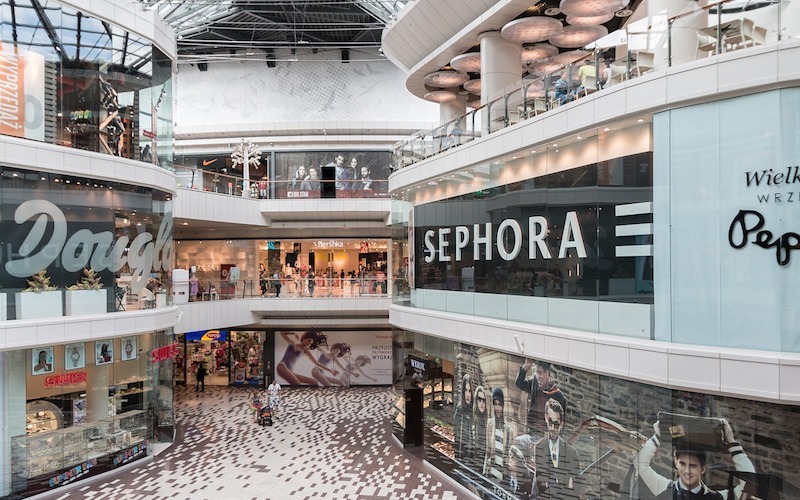 By incorporating advanced tech and combining the best of online and in-store traits, companies can offer shoppers a unique experience that encourages them to choose mall shopping. Here are some of the ways malls are using technology to attract shoppers. Stores are starting to employ robotics and smart digital assistant technology to make shoppers’ experiences more convenient. In 2016, a company called SoftBank piloted a robot assistant named Pepper in retail stores in California. The robot can talk with customers, provide directions, and answer questions. The company reported the stores where the pilots took place saw increased foot traffic and revenue. Piaggio, the company that makes Vespa scooters, has created a robot called Gita – a small, round robot that can follow shoppers around and carry up to 45 pounds. Robots can also help customers find specific items. A hardware store in California recently introduced robots called OSHbots. They can roll around the store, talk to people, and identify objects using a 3D sensing camera. Customers can hold an item, such as a bracket or screw, in front of the robot, and the bot could identify it and take the customer to the correct aisle. Companies are also integrating digital assistants into the shopping experience without the use of robots. Retailer Neiman Marcus is rolling out smart mirrors in its stores, and other companies are starting to do the same. The Neiman Marcus mirrors allow shoppers to see 360-degree views of outfits they’re trying on and uses augmented reality to let them view clothing in different colors. This tech enables them to try on different versions of an item without having to change. This same concept can also be applied to beauty products and hairstyles. The digital assistants can also make product recommendations and call an associate if the shopper needs help. These smart mirrors represent an effort by retail stores to combine the best of online and in-store shopping. Customers can try on clothes to see how they look and feel, but also digitally cycle through different colors, patterns, and other options. Malls may also start adding tech to another room with a mirror – the bathroom. Most of us already bring our tech into the restroom. In one survey, 75 percent of respondents admitted to using their cellphones while in the loo. Smart restroom companies now give malls the ability to integrate tech directly into their public restrooms. Tech startup AUR2 offers smart bathroom technologies that help businesses monitor soap and toilet paper supply levels, as well as sink and toilet usage. The company also sells self-cleaning toilet technology and lights you can install above stall doors that indicate whether they’re available or occupied. One of the company’s first clients is Christiana Mall in Newark, DE. These technologies can help keep bathrooms well-stocked and clean, and reduce wait times by as much as 50 percent. Personal care and beauty retailer Sephora has integrated this idea into a mobile app. The Sephora Virtual Artist app allows users to virtually try on different products using their smartphone, tablet, or laptop. It’s just one of many shopping apps customers can use both in and out of stores. Third-party retail shopping apps and those stores create themselves can suggest special deals to customers or inform them of new product arrivals. A survey by Retail Dive found 57 percent of shoppers use retailers’ mobile apps while they’re in the store. Retailers can offer features such as in-store directions, product recommendations, and online ordering in case an item is out of stock. Using a mobile app to interact with customers allows for personalized experiences that can help consumers feel connected to a brand. Companies can incentivize customers to use their apps by offering special in-app discounts. Malls may be struggling a bit, but they’re not doomed yet. If they can catch up with the times, they may be able to use technology to create engaging experiences for customers that keep them coming back. Technology may have had a hand in causing malls’ recent troubles, but it might also be the thing that saves them.